This weeks box,March 2,2019,we look a bit further then our warehouse for our veggie box,adding in some of our own farm raised meats from our freezer and some local mushrooms, and call it a FARM BOX from Your Farmers. Change ups are offered each week in the email. Our Breakfast Box varies each week but usually will have Whole wheat Oatmeal Muffin Mix (makes 24 large muffins),a Whole Wheat Pancake Mix or a Kg bag of our own rolled oats, along with eggs and some of our breakfast meat. We freshly mill flour from our own organic Red Fife wheat and use it in our mixes and roll our oatmeal from PEI organic oats. Local foods to eat in the winter time or any time of the year on P.E.I. 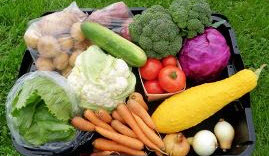 We produce a Veggie Box each week from the end of June until the third week of December and bi-weekly from January until June. Unlike other CSA programs which require you to pay up front, we prefer a pay-as-you-go system. The only thing we ask is that you pay for two boxes the first time($60) so you are always paid one week ahead. Signing on is easy! Just email us and or fill out our online form and we can add you to the email list for your pick up area. You will receive an email each week before delivery day to let you know what's in that week's box. We provide a 'change-up' option so you can swap veggies if you like. Our philosophy is that we don't want families wasting their veggies. If you can't find you use everything in the one week, then you can go bi-weekly, skip a week when you need to, or maybe you have a friend or a family member to share with. We just want as many families as possible to eat good organic, healthy food. 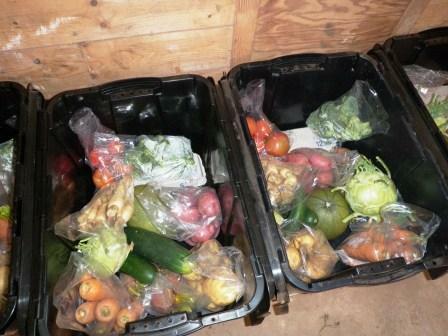 1 Veggie Box 2 Veggie Boxes 3 Veggie Boxes No Veggie Box Today!